UNITED NATIONS, November 4 -- As Kenya's intervention in Somalia continues, past bombing Internally Displaced Persons to threatening any aircraft from landing at Baidoa in Somalia, silence at the UN continues. But it will, Inner City Press learned Friday, result at least in a meeting between the Security Council president for November and Kenya's Ambassador early next week. Video here, from Minute 3. 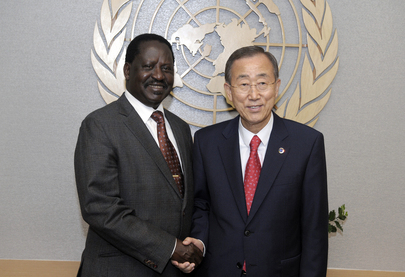 Inner City Press has twice asked Secretary General Ban Ki-moon's spokesman Martin Nesirky about Kenya's entry into Somalia. Asked Friday about Kenya's Baidoa "no fly zone," Nesirky directed Inner City Press to statements of Ban's envoy Augustine Mahiga. Inner City Press asked, "Has Mahiga said anything about Kenya's threat to airplanes in Somalia?" No, Nesirky said, not yet. Video here, from Minute 8:41. Mahiga was strikingly accepting of Kenya's bombing of the IDP camp, which Doctors Without Borders MSF says killed five civilians. On November 3 Inner City Press asked November's Security Council president, Portugal's Ambassador Jose Filipe Moraes Cabral, if he was aware of letters to the Council from Kenya. Cabral said no, he was not aware. Inner City Press asked him, doesn't the Security Council's total inaction on this "hot" war undermine the UN's credibility? "We'll look into it carefully," Cabral said. Video here, form Minute 7:50. The next day on November 4, Inner City Press asked again about the letter(s) and what Cabral would do. Cabral replied this time that yes, there was correspondence during the last Presidency -- that is in October, under the Nigerian presidency. He added that he will "meet Kenya's Ambassador at the beginning of next week." Video here, at Minute 3. Off camera, Inner City Press asked Cabral about the meeting. Kenya will want to explain what it had done, Cabral predicted. Kenya is accusing Eritrea of arming Al Shabab. The Security Council is considering imposing additional sanctions on Eritrea for this and other reasons. But now that Eritrea's president Isaias Afwerki has asked to speak to the Security Council, the US is opposing Afwerki's request -- click here for the explanation US Ambassador Rice gave Inner City Press on November 3. Inner City Press asked Ban's spokesman Nesirky if Ban, as the UN system's top official, thought that a head of state, when he or she asks to address an organ like the Security Council, should be allowed to: if talking is better that not talking. Video here, from Minute 9:30. Ban's spokesman Nesirky said, "it's for the Security Council to decide." Some wonder whether previous Secretaries General would have had NOTHING to say about the legality and impacts of one country's intervention into another, or about one country's block on a head of state whose country faces sanctions addressing those who'll vote on sanctions. This seems to be beyond "quiet diplomacy." Watch this site.